In spite of blistering heat and the threat of smoke from Northern California wildfires, hundreds turned out July 21 to celebrate Mt. 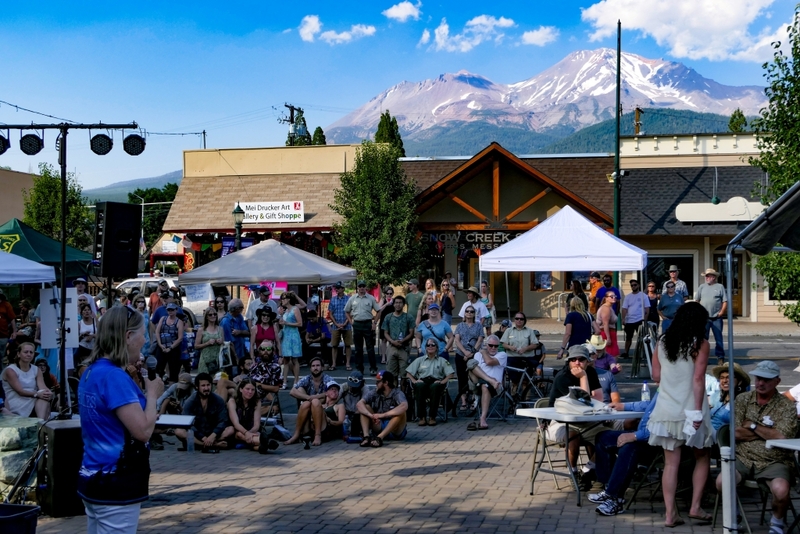 Shasta’s new status as the Pacific Crest Trail Association’s first official Pacific Crest Trail Town. On the day before the event, thick smoke from wildfires obscured the normally spectacular view of the Northern California city’s namesake volcanic peak. But shifting winds pushed the smoke north on Saturday, restoring the grand scenery. 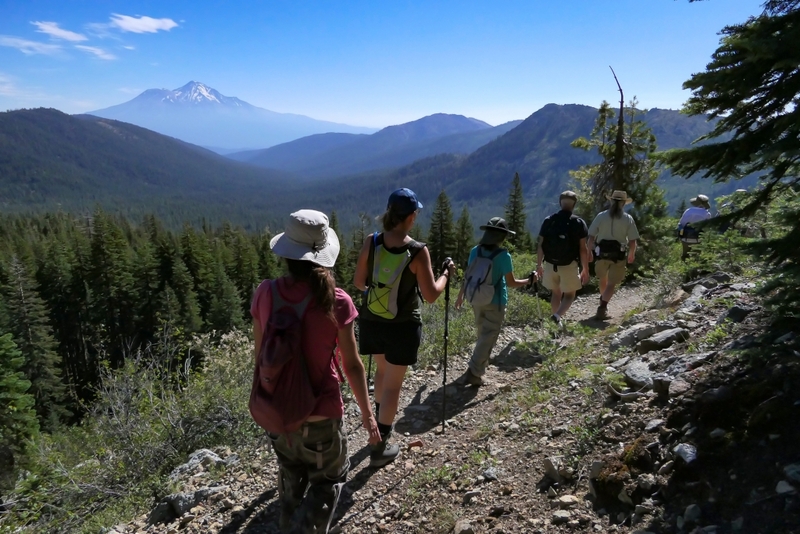 Almost 50 people gathered at 8 a.m. for a guided hike on the PCT in the Trinity Alps. Arriving at the Gumboot trailhead in Shasta-Trinity National Forest, the hikers headed south along one of the most breathtaking PCT sections in the region. Conversations flowed with the trail as it revealed alternating ridgeline views to the east and west. While the hikers enjoyed the PCT, tents were pitched on a downtown block that was closed to vehicles. By noon the kettle corn was popping and the iced lemonade flowing as crowds filled Mt. Shasta Boulevard for food, games and to learn about all the trail-based recreation in the region. Dozens of kids and grownups tested their coordinated pulls on a crosscut saw and a fir log. Participants at the celebration included the U.S. Forest Service, the PCTA, Siskiyou County, the Mt. 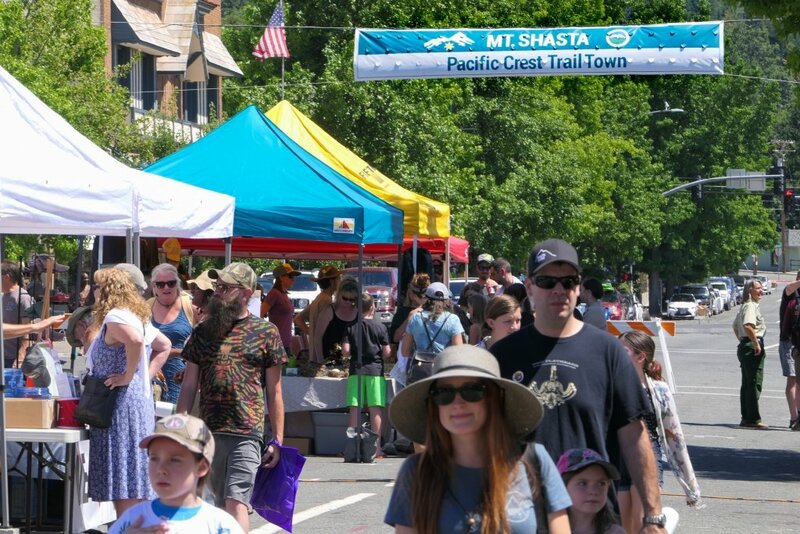 Shasta Trail Association, Leave No Trace, the Boy Scouts and a variety of other local businesses and organizations. 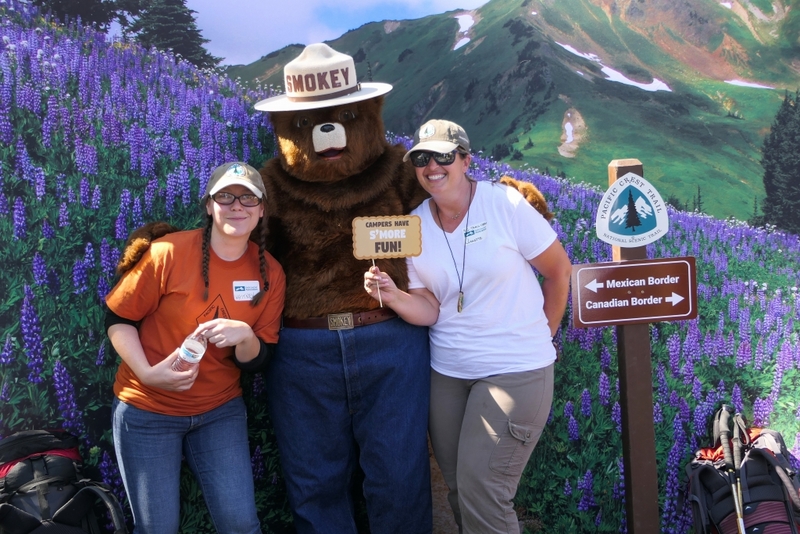 A backdrop with a large photo of the PCT and fun props such as backpacks and trekking poles was a big hit for people getting selfies “on the trail” — and some folks were lucky enough to pose with Smokey the Bear, whose message seemed more timely than ever. At 5 p.m., the crowd gathered in Parker Plaza for speakers to commemorate Mt. Shasta’s new trail town recognition. More than a dozen PCT thru-hikers, taking a “zero day” in town, joined the festivities. Mt. Shasta Mayor Kathy Morter thanked event organizers and the community for their support of the trail town program. PCTA Executive Director Liz Bergeron, Shasta-Trinity National Forest District Ranger Carolyn Napper, Siskiyou County Administrator Ed Valenzuela, and Barry Price of the Mt. Shasta Trail Association also made remarks. Between the speakers a variety of trail gear raffle prizes were given out to excited winners. The ceremony concluded with a special announcement of $50,000 in funding from the Forest Service and the Mt. Shasta Trail Association for new restroom facilities at the Parks Creek trailhead on the PCT. Then the live music began as local bands “Wind Fields” and “Secret Society Handshake” rocked the block and everyone danced into the evening. 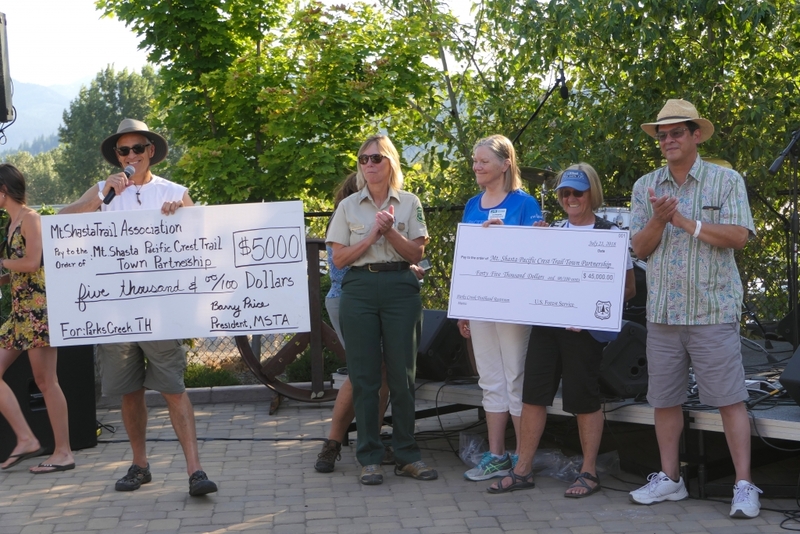 A special announcement was made about $50,000 in funding for new facilities at the Parks Creek trailhead on the PCT.